From Ein Buch von guter Spice is the earliest known German language cookbook. 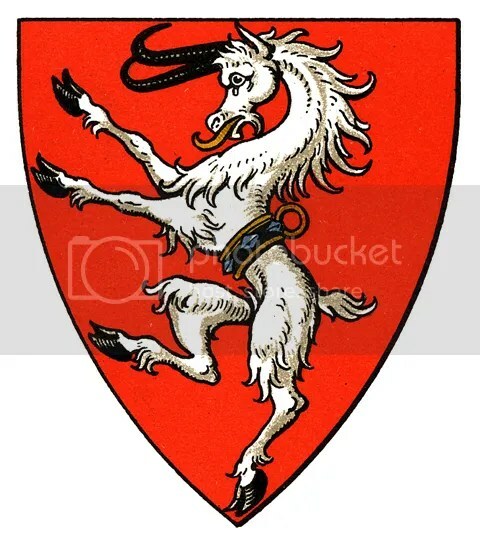 It is dated from between 1345 to 1354. My translations were taken from this website over here. Nim mandel kern. mache in schoene in siedem wazzer. und wirf sie kalt wazzer. loese die garsten und stoz die besten in einem mörser. Alse sie veiste beginnen. so sprenge dor uf ein kalt wazzer. und stoz sie vaste und menge sie mit kaldem wazzere eben dicke. und rink sie durch ein schoen tuch. und tu die kafen wider in den mörser. stoz sie und rink sie uz. schütez allez in ein phannen. und halt sie über daz fiur. und tu darzu ein eyer schaln vol wines. und rüerez wol untz daz ez gesiede. nim ein schün büteltuch und lege ez uf reine stro. und giuz dor uf die milich. biz daz sie wol über sige. swaz denne uf dem tuche belibe. do von mache einen kese. wilt du butern dor uz machen. so laz ein wenic saffrans do mit erwallen. und gibz hin als butern oder kese. Take almonds. Make them beautiful in boiling water (Blanch them). And throw them in cold water. Remove the rancid (almonds) and pound the best in a mortar. When they begin to be oily, so sprinkle thereon a cold water. And pound them strong and mix them with cold water smooth and thick. And wring it through a fine towel. And do the pods/husks in the mortar again. Pound them and wring them out. Pour all in a pan and hold it over the fire. 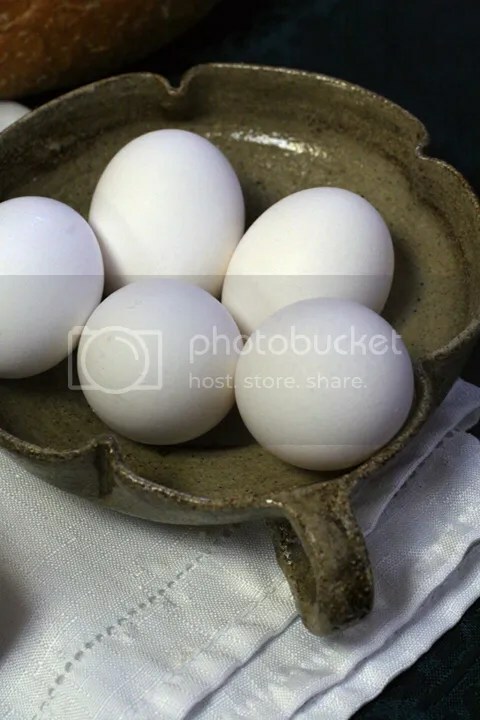 And add thereto an egg shell full of wine, and stir it well and (so) that it is boiled. Take a good servant-cloth and lay it on clean straw. And pour thereon the milk, until it drops well over that (Probably means until the whey runs out. ), (and) which then stays on the towel. Therefrom make a cheese. If you want to make butter out of it, so let a little saffron boil with it (but this needs to be done when the almond milk is made). And give it out as butter or cheese. Wilt du machen ein cyger von mandeln. so nim mandelkern. und stoz die in einem mörser. und die mandelmilch erwelle und schüte sie uf ein schoen tuch. und einen shaub drunder. und laz in erküeln. und slahe in uf eine schüzzeln. und stoz dor uf mandelkern. und strauw da ruf zucker und gibz hin. How you want to make a cheese of almonds. So take almond kernels. And pound them in a mortar. And boil the almond milk and pour it on a fine cloth. And tangled straw thereunder. And let it cool. And put it on a bowl. And pound thereon almond kernels. And strew thereon sugar and give out. Wilt du machen aber einen kese von mandeln. so nim mandelkern und stoz die. und nim die milich und slahe eyer dor in. giuz einer guten milich dorzu. und erwelle daz abe. und schütez uf ein tuch. laz in erkalden. und lege in uf einen kesenapf. und mache in. und lege in denne uf ein teler. bestrauwe in mit eime zucker. daz heizzet ein mandelkese. How you want to make but a cheese of almonds. So take almond kernels and pound them. And take the milk and mix eggs therein. Pour a good milk thereto. And boil it down. And pour it on a cloth. Let it cool. And lay it on a cheese bowl. And make (shape) it. And lay it then on a plate. Strew it with a sugar. That is called almond cheese. to boil over to take it and cool it. This I presume is called clere honey. And, when honey was so much in use, it appears from Barnes that refining it was a trade of itself. were not the same. Sugar was clarified sometimes with wine. same may be said of the Editor’s MS. 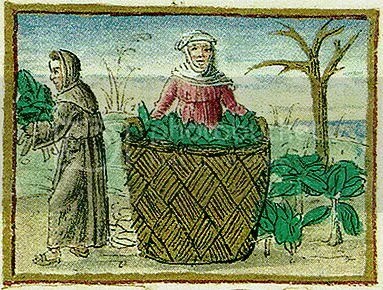 The spices came from the same part of the world, and by the same route, as sugar did. The spicery was an ancient department at court, and had its proper officers. Cinamon. Canell. Canel, Editor’s MS. Kanell, ibid. is the Italian Canella. See Chaucer. We have the flour or powder, See Wiclif. It is not once mentioned in Apicius. now use the singular, mace. See Junii Etym. Cloves. Dishes are flourished with them, Editor’s MS.
10. where we have clowys gylofres, as in our Roll. Powdour gylofre occurs. Chaucer has clowe in the singular, and see him v. Clove-gelofer. as we may suppose, by way of Alexandria. We obtained it no doubt, in the 14th century, from the same quarter, though not exactly by the same route, but by Venice or Genoa. It is used both whole, and in powder. And long-pepper occurs, if we read the place rightly. mess, 139. quÃlre whether gyngyn is not misread for gyngyr, for see Junii Etym. The Romans had their ginger from Troglodytica . Cubebs, 64. 121. are a warm spicy grain from the east. Grains of Paradice, or de parys are the greater cardamoms. Powder-douce, which occurs so often, has been thought by some, who have just peeped into our Roll, to be the same as sugar, and only a different name for it; but they are plainly mistaken, as is evident from where they are mentioned together as different things. In short, I take powder-douce to be either powder of galyngal, for see Editor’s MS II. 20. 24, or a compound made of sundry aromatic spices ground or beaten small, and kept always ready at hand in some proper receptacle. It is otherwise termed good powders or powder simply. White powder-douce occurs, which seems to be the same as blanch-powder, called blaynshe powder, and bought ready prepared, in Northumb. Book. It is sometimes used with powder-fort for which see the next and last article. douce. This Speght says is what gingerbread is made of; but Skinner disapproves this explanation, yet, says Mr. Urry, gives none of his own. It were to be wished indeed, that the Reader could be made acquainted with the names of our “master-cooks,” but it is not in the power of the Editor to gratify him in that; this, however, he may be assured of, that as the Art was of consequence in the reign of Richard, a prince renowned and celebrated in the Roll, for the splendor and elegance of his table, they must have been persons of no inconsiderable rank: the king’s first and second cooks are now esquires by their office, and there is all the reason in the world to believe they were of equal dignity heretofore. To say a word of king Richard: he is said in the proeme to have been ‘acounted the best and ryallest vyaund [curioso in eating] of all esten kynges.’ This, however, must rest upon the testimony of our cooks, since it does not appear otherwise by the suffrage of history, that he was particularly remarkable for his niceness and delicacy in eating, like Heliogabalus, whose favourite dishes are said to have been the tongues of peacocks and nightingales, and the brains of parrots and pheasants; or like Sept. Geta, who, according to Jul. Capitolinus, was so curious, so whimsical, as to order the dishes at his dinners to consist of things which all began with the same letters. a prÃ¦mium to any one that invented and served him with some novel cate; and Sergius Orata built a house at the entrance of the Lucrine lake, purposely for the pleasure and convenience of eating the oysters perfectly fresh. Richard II is certainly not represented in story as resembling any such epicures, or capriccioso’s, as these. It may, however, be fairly presumed, that good living was not wanting among the luxuries of that effeminate and dissipated reign. For the person that wants to cook historically, it’s certainly a real challenge. There are a number of types of enthusiasts out there with varying levels of involvement, i.e. “how much time and money do I want to put into cooking historically?” Some people love going to the library (yes, Virginia, those things are still around) and research old texts, while others would prefer finding recipes online. With the internet, there has been a great insurgence of information, which is both good and bad. Sometimes you have to wade through the bad stuff to get to the good. Things that you would think would be online, just aren’t on, and well… I think most people that have been online for research, get this. Daz buoch von guoter spise, is a German manuscript dated between 1345 and 1354, which the original being in the university library at Munich. The translation is over here if you are looking for some Historical German recipes to have some fun with. These aren’t redacted, but at least they give you some ideas of what to use. Here is my first recipe post which I think is fitting for the first of the year. I did this one many years ago and it’s the first recipe/redaction I have actually found. Unfortunately my stash of recipes are lost. Hopefully I will uncover them soon. 66. Leche Lumbard. Take rawe pork and pulle of the skyn, and pyke out esynewes, and bray the pork in a morter with ayron rawe. Do erto sugur, salt, raysouns coraunce, dates mynced, and powdour of peper, powdour gylofre; & do it in a bladder, and lat it see til it be ynowhgh. And whan it is ynowh, kerf it; leshe it in liknesse of a peskodde; and take grete raysouns and grynde hem in a morter. Drawe hem vp wi rede wyne. 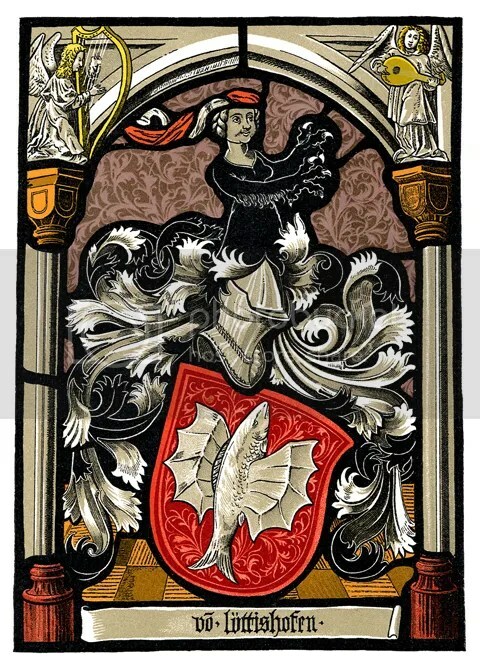 Do erto mylke of almaundes. Colour it with saundres & safroun, and do erto powdour of peper & of gilofre and boile it. 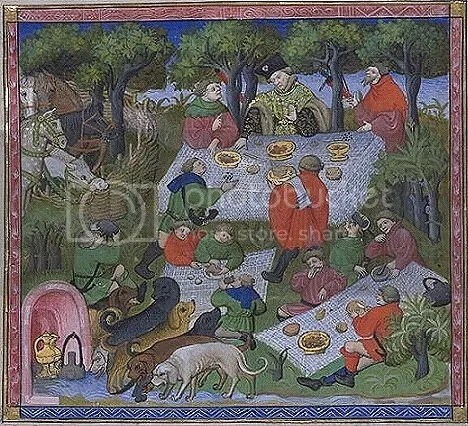 And whan it is boiled, take powdour canel and gynger and temper it vp with wyne, and do alle ise thynges togyder, and loke at it be rennyng; and lat it not see after at it is cast togyder, & serue it forth. Hieatt, Constance B. and Sharon Butler. Curye on Inglish: English Culinary Manuscripts of the Fourteenth-Century (Including the Forme of Cury). London: For the Early English Text Society by the Oxford University Press, 1985. 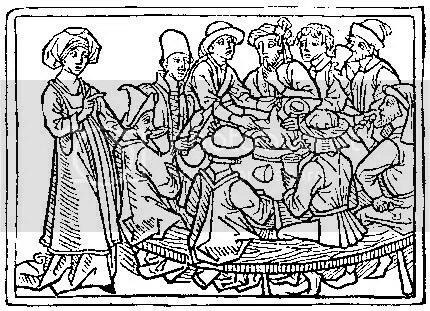 Gode Cookery translation: Take raw pork and pull off the skin, and pick out the sinews, and pound the pork in a morter with raw eggs. Do there to sugar, salt, currants, minced dates, and powder of pepper, powder cloves; & do it in a bladder, and let it boil til it be done. And when it is done, carve it; slice it in the likeness of a peaspod; and take great raisins and grind them in a morter. Blend it with red wine. Do there to milk of almonds. Color it with sandlewood & saffron, and do there to powder of pepper & of cloves and boil it. And when it is boiled, take cinnamon powder and ginger and mix it up with wine, and do all these things together, and look that it be rennet (coagulated); and let it not boil after that it is cast together, & serve it forth. 1. Take all of the ingredients and mix them up in a bowl together. Try to get a consistent mixture so that all the fruit and spices are distributed evenly. 2. Cover a baking sheet with tin foil and form meat mixtures into a shape (if you want to see the original directions for peaspod, please go to the website stated above). Mine was a sun. I tried to keep it no taller/thicker than an inch and a half so everything cooked evenly. 3. Put in oven at 350 degrees for roughly 35 minutes. I originally made a 2-pound batch, which I left in for 40 minutes, which was a little too long for my tastes (turned a little dry). It should be a light golden brown. 1. Place in saucepan everything but the ginger and rosemary. Bring to a boil, and then bring temperature down to a simmer. Allow to boil down for at least 20 to 30 minutes. 2. Near the end of the simmering, add ginger and rosemary. Because mine didn’t thicken, I added about 1 tablespoon arrowroot, but when I did it the second time, it thickened. So go figure. 1. Clean the excess fat off of the meatloaf and then put in the center of a large plate. 2. Pour sauce around the loaf (not over). When I cook I do fudge the measurements depending on the taste as I cook it. I realize that the first time I added a lot more pepper than noted above because I like pepper. Also, I don’t like wine sauces, so I added more almond milk to balance off the wine flavor. You can change things where you see fit.